What is the Exodus wallet? Exodus is a software wallet that provides a client interface for you to access and transfer your cryptocurrency holdings. 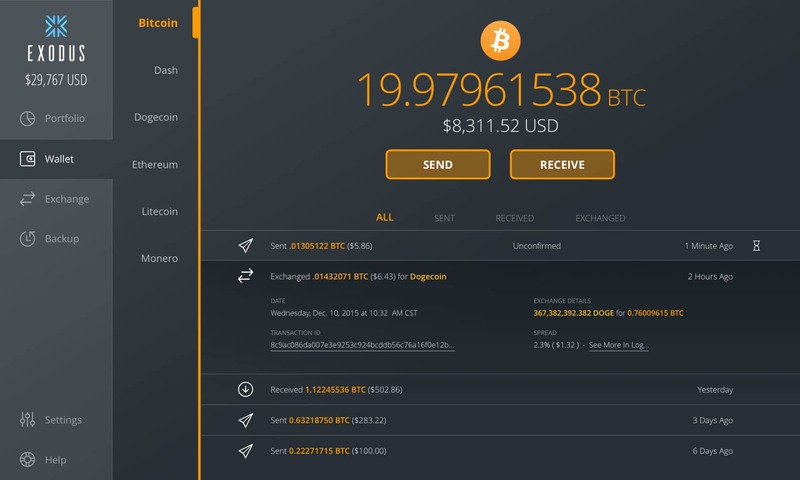 What is the difference between the Exodus bitcoin wallet and the Exodus crypto wallet? There's no difference between the two. You store all of your crypto in one Exodus wallet. How can I acquire the Exodus wallet? You can acquire an Exodus wallet directly from their website here. Officially launched on July 29, 2016, the Exodus wallet is one of the newer options to store your cryptocurrency. Exodus is a software wallet that provides a client interface for you to access and transfer your cryptocurrency holdings. As a software wallet connected to the internet, Exodus is inherently more risky to use than hardware wallet alternatives such as Ledger or Trezor. Support for new coins is constantly being developed as well. You can find a list of coins on their roadmap here. The Exodus wallet interface is beautiful – plain and simple. Designed for “people who have never used an exchange”, the wallet avoids using technical jargon and you’re able to perform each available action in a straightforward step-by-step process. The design team has even gone so far as to ensure that each icon is pixel perfect to fit in easily with the rest of the layout. The Good: The Exodus wallet has received an overwhelming amount of positive feedback from its customers. The wallet has a 4.4 out of 5-star average on CryptoCompare with over 260 reviews. Users share my love for the interface design, and many have praised the company for their quick and helpful support team. In an industry where support is often the lowest priority, this is great to see. The Bad: Even with a well-designed client and spot-on customer service, Exodus does have some room for improvement. Currently, you’re unable to use two-factor authentication for your account. This poses a security risk that you don’t have to worry about on most other wallets. Some customers have also expressed dissatisfaction with the lack of a mobile app. I’m confident that as Exodus grows, both of these feature requests will be developed. Exodus is free to download and use; however, the company does charge fees to exchange and send currencies through the wallet. Some customers have reported that these fees are much higher than other competitors. The wallet is probably where you’re going to be spending most of your time. Here, you can see the balances of all your coins, monitor your transactions, and send/receive funds. You’re even able to filter your transactions by “sent”, “received”, and “exchanged” – a convenient feature to further help keep you organized. I can’t emphasize enough how impressed I am with the team’s dedication to providing an outstanding user experience. To get a high-level overview of your holdings, you can check out the portfolio page. Simply designed, this section shows the percentage breakdown of each coin you own and the associated dollar value. Exodus is integrated with ShapeShift. This means you can swap coins directly in the wallet without having to send them to an exchange. The exchange screen clearly shows the amount you’re going to receive in the swap (both in crypto and fiat values) as well as the current spread of the transaction. The wallet goes to great lengths to ensure that there’s no confusion when making the trade. If you lose your computer or need to restore your account for some reason, you have a couple options on how to access your assets again. The easiest way is through the one-click email restore system. When you create an account, you’re sent an email with a backup link to restore your account. Just click on this link and enter your password to complete the process. You’re also given a 12-word passphrase when you create an account. Do not lose or forget this phrase. If you can’t access your email, or you forget your password, you must enter this to receive access to your account. There is no other way to get into your account if you misplace the passphrase. Can I trust these guys? Unfortunately, the Exodus wallet is not 100% open-source, so you’ll be putting your trust into the developers and management team by using their wallet. However, the CTO, JP Richardson, has created over 190 open source libraries and is highly trusted within the development community. As a young company, Exodus has not had the time to implement the security features that many other wallets include. Your blockchain assets are fully encrypted but are only protected by a password. There’s no two-factor authentication which exposes you to more risk if you inadvertently download malware or a malicious software program. The company actually recommends that you use a different wallet with either multi-sig (like Copay) or a hardware component (like Ledger) if you’re planning on storing large amounts of blockchain assets. The Exodus team is aware of their security flaws and is currently talking with hardware providers to begin improving these weaknesses. Exodus support is A+. Their support site has a knowledge base with over 100 articles explaining different features, fee structure, troubleshooting, and 17 other general topics. Beyond a comprehensive list of FAQs, many of the associated articles include videos to further help you out. If you can’t find what you’re looking for in the knowledge base area, you’re able to contact the support team via email. Countless reviewers have shared the amazing experience they’ve had working through issues with the Exodus support team. Support tickets are answered promptly, and the company works diligently to fully resolve every issue. This may be my new favorite software wallet. I’m a huge design and user experience nerd, so the attention to detail that Exodus gives to provide you with a seamless experience really wins me over. With excellent customer support, a transparent roadmap, and multi-coin support, it’s easy to see why this wallet is loved by the community. I’m excited to see how this company grows as they improve wallet security and continue to add new functionality.